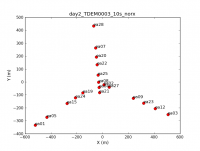 This tutorial describes the data reduction for two spectral lines observed toward the Asymptotic Giant Branch (AGB) star IRC+10216. 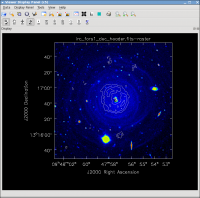 In this VLA observation, one subband (spectral window) was observed in each of the two basebands, with the subbands centered on the HC3N and SiS lines near 36 GHz. 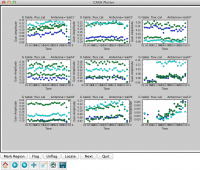 The raw data were loaded into CASA with importevla, where zero and shadowed data were flagged (note that this is done by the NRAO Data Archive). 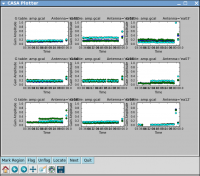 Then the data were split, so we could average from the native 1-second integrations to 10 seconds, selecting only antennas with Ka-band receivers and only spectral windows (called spw in CASA) with Ka-band data. This produces a significantly smaller data set for processing. 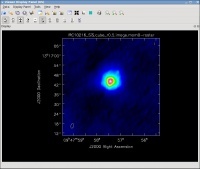 IRC+10216 (CW Leo) (see Figure 1) is the brightest star in the sky at 5 microns, but only 16th magnitude visually. It was discovered during the first survey of the infrared sky, carried out by Bob Leighton and Gerry Neugebauer in 1965. This Asymptotic Giant Branch star is a Mira-type variable going through prodigious episodic mass loss. The dust condensed from the atmosphere during the mass loss is responsible for the millimeter and infrared emission; the radio continuum emission probes the actual stellar photosphere. Molecules form along with the dust, and a steady state chemistry occurs in the dense inner regions (Tsuji 1973 A&A 23, 411). As the density of material drops, the chemistry freezes, but the molecules continue their long coast outward into the Galaxy. As the shell thins, ultraviolet light from the ambient galactic radiation field penetrates and initiates a new chemistry in the gas. SiS, a simple molecule created in the dense inner envelope chemistry, is photodissociated as it coasts out into the shell. The result is the centrally condensed emission we see in the present observations. Interestingly, in the next lower transition at 18 GHz, the line shape is much different from what we see here. At the extreme velocities in the profile, very bright narrow emission is seen which has been interpreted as maser emission. More VLA observations of this line can be found in the NRAO Data Archive. HC3N, a much more complex molecule, is created by photochemistry that is triggered when atoms and pieces of molecules, destroyed by ultraviolet radiation, undergo the next phase of chemistry in the shell. HC3N has many vibrational modes, which may be excited, in addition to its rotational modes. Owing to this, it can re-radiate energy absorbed from ultraviolet radiation more effectively than some molecules with a single bond. Eventually, it too is destroyed. 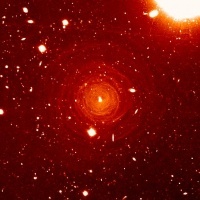 However, during its brief existence, its rise to abundance in the envelope results in a ring of emission, which is what is observed in this image made with the VLA. Cordiner & Millar (2009, ApJ, 697, 68) describe a new chemical model for the shell, which also takes into account the variation of mass loss by the star. These authors show that in addition to purely chemical effects, local gas and dust density peaks play a role in shaping the observed emission. All of that information we should keep in mind during the calibration, e.g., if the mentioned list of unavailable receivers do appear in the data, the data is just noise and should be flagged. For the data set that you have downloaded, these antennas have already been removed. Also, keep an eye on other messages such as loss of data, subreflector problems, or any other such issues. If they were not captured in the online flagging, they should be carefully inspected and treated appropriately during calibration or flagged. Below we have cut and pasted output from the logger that is listed after the observed scan listing. Note that Field refers to an observed phase center, i.e., a position in the sky. 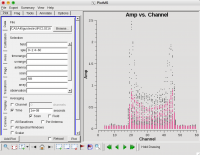 A Source refers to a Field using a specific frequency setting. Source J1008+0730, with ID 0, does not show up in the Field listing as this source did not generate any unflagged visibilities in the data set for these Ka-band observations. It was used for pointing in C-band only. Next, look at a graphical plot of the antenna locations and save a hard copy in case you want it later (see Figure 3). This will be useful for picking a reference antenna&#151;typically a good choice is an antenna close to the center of the array, but not too close to the center that is suffers from shadowing (as could be in this D-array configuration). Unless it shows problems after inspection of the data, we provisionally choose ea02. Now zoom in on the region very near zero amplitude for sources J0954+1743 and IRC+10216 between 3h30 and 4h30 (see Figure 6). To zoom, select the Zoom tool in the lower left corner of the plotms GUI, then you can left click to draw a box. Look for the low values (you may want to zoom in a few times to really see the suspect points clearly). Now use the Mark Region and Locate buttons (positioned along the bottom of the GUI) to see which antenna is causing problems. The output is be shown in the logger. Since all the located baselines include ea12, this is likely the responsible antenna. the "reload" box in the lower left before clicking Plot, or do Shift+Plot. If you set antenna to 'ea12' and zoom in on this initial time range, you can also see that ea12 is bad during the same time range as for spw 0. 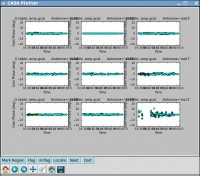 You can also see this by entering '!ea07' in the antenna parameter, which removes ea07 from the plot (in CASA, ! deselects). Actually, one should also flag some bad data from antenna ea08..
As mentioned in the observing log above, antennas ea10, ea12, and ea22 do not have good baseline positions. Antenna ea10 was not in the array, but for the other two antennas we need to check for any improved baseline positions that were derived after the observations were taken. In CASA, these corrections can be derived by gencal for the VLA. The parameter caltype='antpos' will use antenna position offset values and create a calibration table for the delay changes that this correction involves. If the 'antenna' parameter is not specified, gencal will query the VLA webpages for the offsets (VLA Baseline Corrections page). Apparently more antennas than the ones noted already by the operator in the log needed, and now benefit from updated positions although ea12 and ea22 clearly have the largest corrections. Please note: if you are reducing VLA data taken before March 1, 2010, you need to set caltype='antposvla' . Before this date the automated lookup will not work and one has to specify the the antenna positions explicitly. 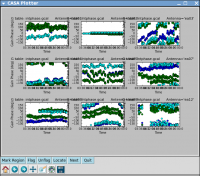 Opacity corrections are typically only applied for higher frequency observations, where the atmospheric opacity affects the flux density scale if the sources (including calibrators) are observed at different elevations. For lower frequencies the effect is marginal, and opacity correction is usually skipped. 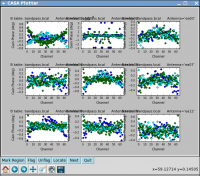 The opacity of the observation can be computed from a seasonal model and/or weather station information. 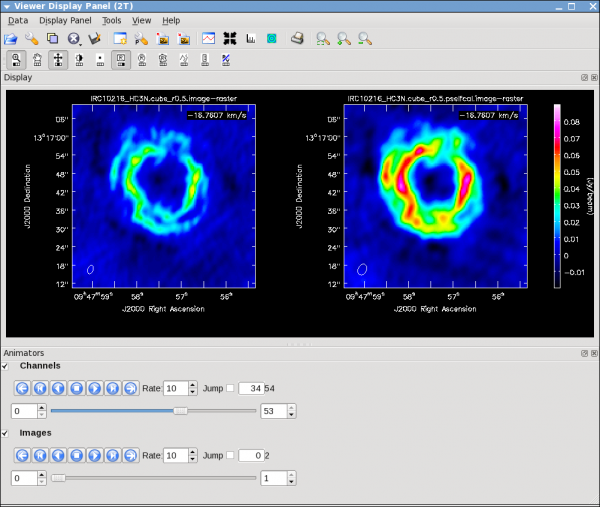 After the zenith opacities are derived, they will be recomputed for the correct elevation of the data automatically using in gaincal, applycal, bandpass, etc. The absolute fluxes for the frequencies of all spectral window channels have now been determined, and one can proceed to the bandpass and complex gain calibrations. From this you can see that the phase variation across the bandpass for each baseline to antenna ea02 is modest. Next check LL, and then spw=1 for both correlations. Also check other antennas if you like. The conclusion from this investigation is that, especially for high frequency observations, you need to correct the phase variations with time before solving for the bandpass to prevent decorrelation of the vector averaged bandpass solution. Since the phase variation as a function of channel is modest (as we noted in Figure 9), you can average over several (or all) channels to increase the signal to noise of the phase vs. time solution. If the phase variation, as a function of channel is larger, you may need to restrict averaging to only a few channels to prevent introducing delay-based closure errors as can happen from averaging over non-bandpass corrected channels with large phase variations. Let's take care of the delay calibration first. The delay is the linear slope of phase across frequency. From the plot we saw that it was rather modest (the phases over frequency per baseline were aligned almost horizontal) and the bandpass calibration will certainly take care of it. Nevertheless, it best to derive a delay calibration first and then calculate the bandpass. The delay calibration is an antenna based calibration solution and it can be derived in gaincal with parameter gaintype='K' . The use of parameter solint='inf' in bandpass will derive one bandpass solution for the whole J1229+0203 scan. Note that if there had been two observations of the bandpass calibrator, this command would have combined the data from both scans to form one bandpass solution, because the default of the combine parameter for bandpass is combine='scan' . To solve for one bandpass for each bandpass calibrator scan you would need to use combine=' ' in the bandpass call. In all calibration tasks, regardless of solint, scan boundaries are only crossed when combine='scan' . Likewise, field (spw) boundaries are only crossed if parameter combine='field' or parameter combine='spw' , the latter two are not generally good ideas for bandpass solutions. Task applycal works like a matrix. The first entries of the gaintable and gainfield lists are to be used together, so are the second entries etc. 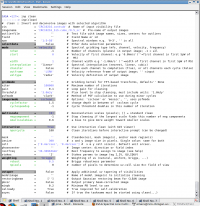 (except for the opacity list, which is referring to spws). All will be applied to the 'field' selection (field='5' in the first line). In the above example, 'antpos.cal' (gaintable='antpos'), which is a field independent solution (gainfield=), is applied to field '5'. The 'bandpass.bcal' (gaintable='bandpass.bcal') that was obtained for field '5' (gainfield='5', the bandpass observation) is also applied to field '5', etc. Again, lists within the lists are fine. Now that we have a bandpass solution to apply, we can solve for the antenna-based phase and amplitude gain calibration. Since the phase changes on a much shorter timescale than the amplitude, at least for the higher frequencies and/or longer baselines, we will solve for them separately. If the phase changes significantly over time and if the un-corrected phase were averaged over this timescale, the amplitude would decorrelate. 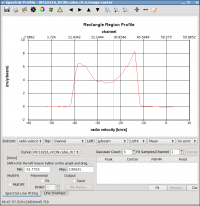 Note that we now also re-solve for the gain solutions of the bandpass calibrator to derive new solutions that are corrected for the bandpass shape. Since the bandpass calibrator will not be used again, while not strictly necessary, it is useful to check its calibrated flux density. We use a minimum signal-to-noise of 2 here as it seems to be a good compromise for using good data without rejecting too many solutions (parameter minsnr = 2 ). Here parameter solint='int' coupled with parameter calmode='p' will derive a single phase solution for each integration (here, as we averaged the data, for every 10 seconds). Note that the bandpass table is applied on-the-fly before solving for the phase solutions, however the bandpass is NOT applied to the data permanently until applycal is run later on. Notice that quite a few solutions are rejected due to SNR < 2 (printed to terminal). For the most part it is only one or two solutions out of >30 so this isn't too worrying. Take note if you see large numbers of rejected solutions per integration; this is likely an indication that solint is too short for the S/N of the data. Note that there are no failed solutions here because of the added S/N acquired by the longer solint (see Figure 16). Alternatively, instead of making a separate phase solution for application to the target, one can also run smoothcal to smooth the solutions derived on the integration time. Now let's look at the resulting phase solutions (see Figure 17). Since we have taken out the phase as best we can by applying the solint='int' phase-only solution, this plot will give a good idea of the residual phase error. If you see scatter of more than a few degrees here, you should consider going back and looking for more data to flag, in particular for the times where these errors are large, or for other effects that may explain this behavior (and flag as necessary). Note that we have restricted the plot range so that all antennas are plotted with the same scale (instead of autoscaled; for the X-axis the -1,-1 values still allow autoscaling) (see Figure 18). We can see that both antenna ea12 (all times) and ea23 (first 1/3 of observation) show particularly large residual phase noise. Note: In all applycal steps we set calwt=F. It is very important to turn off this parameter which determines if the weights are calibrated along with the data. 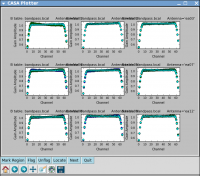 Data from antennas with better receiver performance and/or longer integration times should have higher weights, and it can be advantageous to factor this information into the calibration. Before the VLA upgrade, meaningful weights were available for each visibility. However, at the time of this observation during commissioning, the VLA was not yet recording the information necessary to calculate meaningful weights. 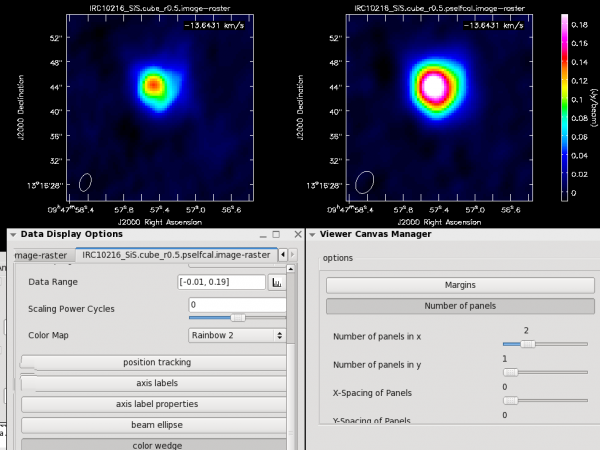 Since these data weights are used at the imaging stage you can get strange results from having calwt=T when the input weights are themselves not meaningful, especially for self-calibration on resolved sources (for example, flux calibrator and target). It may be a good idea to flag ea12 completely&#151;it's just a bit noisy all around and ea23 is pretty noisy during the first scans between the initial and second pointing. Recall that these are antennas had more noisy calibration solutions. Now we split the data into individual files. This is not strictly necessary, as you can select the appropriate fields in later clean stages, but it is safer in case for example you get confused with later processing and want to fall back to this point (this is especially a good idea if you plan to do continuum subtraction or self calibration later on). It also makes smaller individual files in case you want to copy to another machine or want to share the data with a colleague. Now we can make a vector averaged uv-plot of the calibrated target spectral line data. 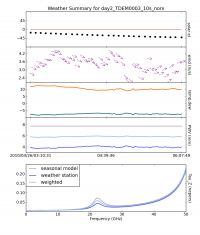 It is important to note that you will only see signal in such a plot if (1) the data are well calibrated, and (2) there is significant signal near the phase center of the observations or if the line emission (or absorption) is weak but extended. If this isn't true for your data, you won't be able to see the line signal in such a plot and will need to make an initial (dirty or lightly cleaned) line+continuum cube to determine the line-free channels. Generally, this is the recommended course for finding the line-free channels more precisely than is being done here, as weak line signal would not be obvious in this plot. You should see the horned profile typical of an expanding shell (see Figure 26). From this plot, you can guess that strong line emission is restricted to channels 18 to 47 (zoom in if necessary to see exactly what the channel numbers are). Now we want to use the line-free channels to create a model of the continuum emission that can be subtracted to create a line-only dataset. We want to refrain from going to close to the edges of the band&#151;these channels are typically noisy, and we don't want to get too close to the line channels because we could only see strong line emission in the vector averaged uv-plot and there may be weaker line emission in the channels next to the channel interval with strong lines. 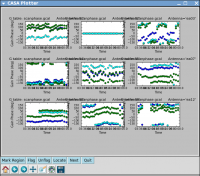 The VLA WIDAR correlator does not support Doppler tracking. 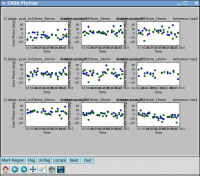 Doppler setting is possible which will use the calculated sky frequency based on the velocity of a source at the start of the observation. 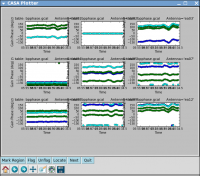 The sky frequency is then fixed throughout that observing run. Typically, a fixed frequency is better for the calibration of interferometric data. The downside, however, is that a spectral line may shift over one or more channels during an observation. Task clean takes care of such a shift when regridding the visibilities in velocity space (default is LSRK) to form an image. Sometimes, in particular when adding together different observing runs, it may be advisable to regrid all data sets to the same velocity grid, combine all data to a single file, then Fourier transform and deconvolve. The tasks cvel, concat, and clean serve this purpose respectively. The following run of cvel shows an example on how the parameters of cvel may be set. imagermode = csclean will invoke the Cotton-Schwab cleaning algorithm and the data will be regridded into a new output velocity frame, correcting for Doppler shifts of the line during the run (VLA data for each observation is always at a fixed sky frequency). The iterations are chosen as a high value to allow many clean cycles when needed. Typically, however, the threshold will kick in earlier and stop the cleaning process. It will take a little while to grid the data, but the viewer will open when it's ready to start an interactive clean. Use the Channels tape deck buttons at the bottom (sometimes it will load on the side) of the Viewer display GUI to step through to the channel with the most extended (in angular size) emission. Select all channels for the clean mask, select the polygon tool , and make a single mask that applies to all channels by clicking on the image to drop anchor points (see Figure 27) and drawing lines between the points; double click for the last point after which you can adjust the anchor points (but be careful not to click outside as that removes the polygon). Once you make the polygon region, you need to double click inside it to save the mask region&#151;if you see the polygon turn white you will know you succeeded. Note, that if you had the time and patience you could make a clean mask for each channel, and this would create a slightly better result. The continuum data set produced with parameter wantcont=True in uvcontsub is the model fit. To image the continuum itself, use the line-free channels. Note that it should be possible to create position velocity cuts using the viewer (as described in the CASA Cookbook). 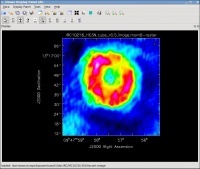 Masking the data cube to extract the emission is described in the Masking_images_for_analysis page. Frequently, one may like to fit Gaussians or polynomials to the spectral line in the data cube. This can be done with CASA's specfit task; specfit can fit those functions to an average spectrum defined by some area, or, alternatively, for each pixel. We will perform the fitting an average spectrum. First, we want to inspect the spectrum. 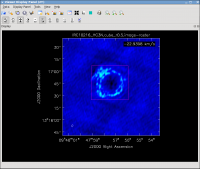 Load the image into the viewer (here the HC3N image cube) and mark a region with the mouse button that is assigned to the rectangular R region in the tool bar. It is probably best to do this at a plane that shows the entire extent of the source. When done, select spectral profile from the Tools menu. The average spectrum will be displayed in a separate panel (see Figure 33). We choose to do the self cal on the spw=1 SiS line data because it has the strongest emission in a single channel and is a bit more compact than the HC3N data. We will run gaincal specifying the channel in the uv-data that has the brightest peak in the image (use the viewer to figure out which channel this is for spw=1), and note the peak flux. Since we started the image with a channel range, we need to account for the fact that the image channel numbers do not map exactly to the uv-data channel numbers (they are off by 5 so that channel 13 in the image is roughly channel 19 in the uv-data). This analysis suggests that the rms noise on one baseline, for one 10 second integration, is about 500 mJy. In contrast, the peak flux density in the strongest SiS channel is only about 200 mJy (you can check using the viewer). Since the emission is fairly compact, most baselines will see about this peak flux; this is why we choose the more compact of the two possible lines. Thus, a 10 second solution interval is not enough to get a SNR of at least 3 on a 200 mJy peak. We need to use a solint large enough so that the rms noise is not worse than about 1/3 of 200 mJy. Thus, a solint of 10 minutes is about the shortest we can use and be reasonably confident of the solutions. This page was last modified on 7 November 2016, at 16:50.